PureDWTS Season 22 Cast Rumors & Watchout: Paige VanZant? PVZ IN THE BUILDING ? E Online has a cool teaser up about Sadie Robertson and her dance tonight on Dancing With The Stars. You can see a sketch of her dress. You can also view what her Uncles might be wearing since they are dancing with her too. Be sure to see everything at E Online. The feathered frock was designed by DWTS costume designer Daniela Gschwendtner, and Sadie is going to wear it while rocking out to Pharrell’s “Hunter” on tonight’s show. But Sadie won’t be dancing with just her partner Mark Ballas; she’s also going to be joined on the dance floor by her uncles! Si, Willie, Jase, and Jep are all going to be in the dance, and we’ve got your first look at their costumes as well! Check out the camo they’ll be sporting, because of course they’re going to wear camo. What else would you expect from the Duck Dynasty men? Aww, it’s great to hear from Karina Smirnoff before the show. She writes a new blog at People about it and her elimination with Randy last week. She also wishes everyone well going forward. I’m just enjoying the fact that Randy and I got to meet each other through the show, and we got to work together. We got to create incredible memories and hopefully gave the show’s audience something to enjoy with all our dances. I’m going to miss the fact that we would laugh at each other and then laugh with each other, the fact that he’s so positive and always optimistic, how strong he is – he literally is probably the strongest guy I’ve ever worked with – and how we found ways to tone it down. I’m going to miss the choreography, the costumes, all of it. It is a fun show. It’s one of those experiences in your life where it gives you the highest of the highs, but then it also quickly reminds you of the lowest of the lows, so you never get too high up there! Going forward, I want all these guys to do well. I love them, they’re my family. I hope they kill it! You can read her full blog at People. If you haven’t seen Ralph Macchio And Karina Smirnoff’s short film “Across Grace Alley”, you can now buy and download at it’s official site. If you see it (or have seen it), let us know what you think of it in comments. Some of the words used to describe it so far in reviews are: ‘beautiful’, ‘touching’, ’emotional’, and ‘lovely’ (sounds like Karina herself). Also, Karina has written a note to her fans at facebook about her elimination with Randy Couture and how thankful she is to have met him and her other partners on Dancing With The Stars. She also wrote about “Across Grace Alley” and it’s release. Below is more. This tears me up. We love you, Karina! A “FLICK”TASTIC MOTION PICTURE SHOW! It surely was A “FLICK”TASTIC MOTION PICTURE SHOW! THE TIME CAME FOR A DANCING PAIR TO LEAVE THE SHOW! KARINA AND RANDY TOOK THEIR BOWS, IT WAS TIME TO GO! NEXT WEEK WILL BE A TEAR JERKER, THE MOST MEMORABLE YEAR! PREPARE YOUR TISSUE SUPPLY, I’LL MEET YOU RIGHT BACK HERE! NOTE: A wish came true for me to see HAND JIVE performed! Sweet! DWTS Season 19, Week 3 – Dancing by the Numbers! So, everyone was surprised to see Randy go – as was I. But in looking back to last weeks “Dancing by the Numbers” post, we probably shouldn’t have been. We’re dealing with SMALL numbers here, and Tavis and Randy were both in a four-way tie, only 11k votes per million votes cast above Michael. What does that mean? Well, it means that for Betsey and Tommy to be safe, they only needed ONE more vote than Randy and Tavis. ONE. It also means that Michael got 11k more vote per million votes cast than both Tavis and Randy (at least). Really, is that SO surprising? Watching Betsey and Tommy last night, I’m not surprised either of the survived. Michael over Tavis – yes, we called that. Michael over Randy?? Ummm…that’s a bit more surprising. But the DWTS audience has shown time and again that they love guys like Michael. Problem is, they also love the Betsey’s and the Tommy’s – as do I. That means one of two things. First is that Michael’s time has very possibly run out. The second is that if Michael’s time hasn’t run out, watch out Antonio. But I get ahead of myself – I haven’t even looked at the numbers yet – that’s just my sense of things in Week 3, going into week four (ALREADY!!). 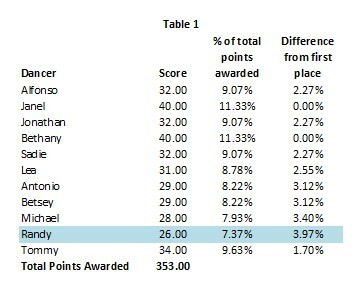 Since Randy had a score awarded to him, I’ve included that in my total. Do they do it that way? Well, they say total judges points awarded, but who knows. At this stage it makes little difference in the votes needed. Read more..
Also, here is some footage of Mark and Sadie on Access Hollywood…. Read more..